FULLERTON, CA. 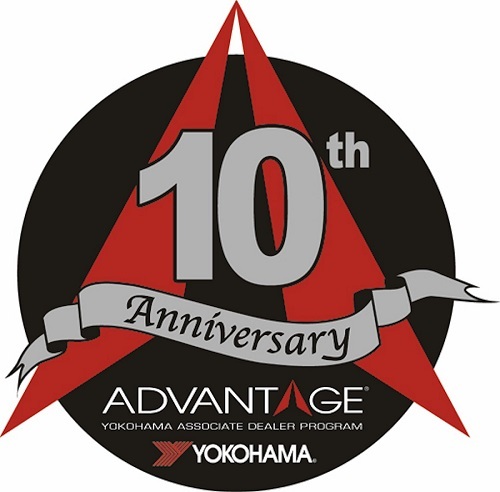 – (April 9, 2013) – Yokohama Tire Corporation is marking the ten-year anniversary of its ground-breaking consumer dealer rewards program, the ADVANTAGE Associate Dealer Program. To celebrate the milestone, the tire maker is offering a double cash rewards promotion through which dealers can earn up to 12 percent in cash on their consumer tire purchases from their designated distributors. The promotion runs now through June 30. “When ADVANTAGE was created by Yokohama a decade ago, it became the benchmark by which many subsequent associate dealer programs in the industry were modeled, ” said Ken Hsu, Yokohama manager, dealer programs. “We forged an innovative partnership with both our distributors and their dealers. This unique platform directly rewarded the dealers with incentives based on Yokohama brand purchases through designated distributors. For details on the ADVANTAGE Associate Dealer Program, please call 1.800.423-4544.